If you remember only one piece of advice for squeezing a bit of luxury out of a budget-priced getaway, make it this: Choose your destination wisely. The easiest way to lower nearly all of your travel expenses without skimping on indulgences is to pick a place where the cost of living is low. You don't have to spend a lot of money to feel like a jetsetting boss while traveling. The trick is a combination of knowing how to get expensive amenities for cheap, while also adopting the mindset that indulgences do not always have to be expensive. Here are seven tips for planning a luxurious trip on a not-so-luxurious budget. If you remember only one piece of advice for squeezing a bit of luxury out of a budget-priced getaway, make it this: Choose your destination wisely. The easiest way to lower nearly all of your travel expenses without skimping on indulgences is to pick a place where the cost of living is low and the exchange rate favorable. For example, I'm planning a summer getaway to the Greek Islands, where 30-buck-a-night beachfront hotels with sweeping views of the Aegean Sea are abundant and seductively simple meals of local wine and produce cost just a handful of euros. Electing to visit Greece -- rather than more expensive European beach destinations, like Corsica or the Cote d'Azur -- allowed me to plan an effortlessly inexpensive yet luxurious trip. To save even more, go somewhere in shoulder season or low season. Choosing a cheap spot won't save you money on the cost of the plane ticket to your destination, but opting to travel in low season will. Freedom from financial constraints is the ultimate luxury. One of the reasons people love all-inclusive resorts is the "leave your wallet behind" mentality that allows you to order unlimited Mai Tais with no concern for costs. Achieve similar peace of mind by planning ahead. First, begin setting aside money for your travels well in advance. Create a spreadsheet or use free personal finance software like Mint, which has an awesome vacation-budgeting tool. Once you've built a cache of travel funds, budget a designated number of "free" spending money for each day of your trip; this will help alleviate the stressful physiological component of spending hard-earned currency while traveling. Airport lounge access. Free Uber rides. Free admission to museums. Credit cards give an everyman access to the kind of exclusive perks normally reserved for high rollers and elite frequent flyers. Invest in a rewarding travel credit card (with no foreign transaction fees, of course) to get double the frills: You'll feel you're a part of an elite club (in a way, you are). And, to put it simply, you'll save money. Want to feel like a fat cat while traveling? Upgrade your plane seat -- no frequent flyer miles or major asset liquidation needed. Just bid for an upgrade. When flying internationally, check to see if your airline offers auctions for seats in first or business class. On flights with less-than-full loads, it's possible to grab an upgrade out of coach for a couple hundred bucks—a more-than-reasonable price for tickets that can cost thousands. Extravagance is subjective. One traveler's luxurious suite with a balcony is another traveler's Michelin-starred dining experience. Which splurges are the most meaningful to you? 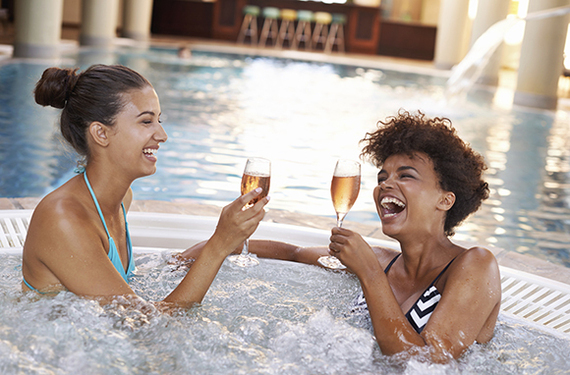 Make a list of the posh perks that you dream about, and prioritize them from most loved to least loved. Choose some luxurious experiences from the top of your list and commit to spending money on them (and only them). You may have to sacrifice other indulgences that are less important to you, whether it's daily cappuccino or a massage, in order to stick to your budget and afford those top-of-the-list splurges. But you can be confident you'll be spending money on truly worthwhile experiences and upgrades. Going to attraction after attraction without worrying about price is something done by two types of people: Those with unlimited funds and those with city tourist cards. In major metropolises around the world, city tourist cards offer tours, admission to attractions, transportation and discounts at select spots for a flat price, usually over a set period of time. You have lots of choices here. CityPass, which sells passes for U.S. cities, is a big name in the industry. And city-specific brands that have partnerships with tourism boards, like The London Pass, are good options as well. Before you buy, compare your costs for admission and transportation for what you want to do and see without the pass, and compare those numbers to the prices of available passes. Pass Comparison has handy calculators that make this process easier. Activities and products that impart a luxury feel aren't always expensive. The trick here is to focus on low- and no-cost things that will make you feel totally wealthy and special. It's the little things that add up to a luxurious lifestyle: Pick up fresh flowers at a local market and put them in your hotel room. Stock up on salon-brand travel-size samples to use on trips (find out how to do that here). Buy a good bottle of wine. Spend an afternoon drinking cappuccinos and people-watching at a fancy coffee shop. Decide what your own version of the good life is, and follow through. Read the original story: How to Plan an Insanely Cheap Trip That Feels Expensive by Caroline Costello, who is a regular contributor to SmarterTravel.